We are open at night! 5 - 9 PM. Many have created something unique just for you, just for this event. Waxlander Gallery - 622 Canyon Road; Serving hot cider from 5 - 7:30 PM. THE Studio - 332 Camino del Monte Sol; Serving refreshments, cookies, and music! (505) 983-7306. Ronnie Layden Fine Art - 901 Canyon Road; Live music! 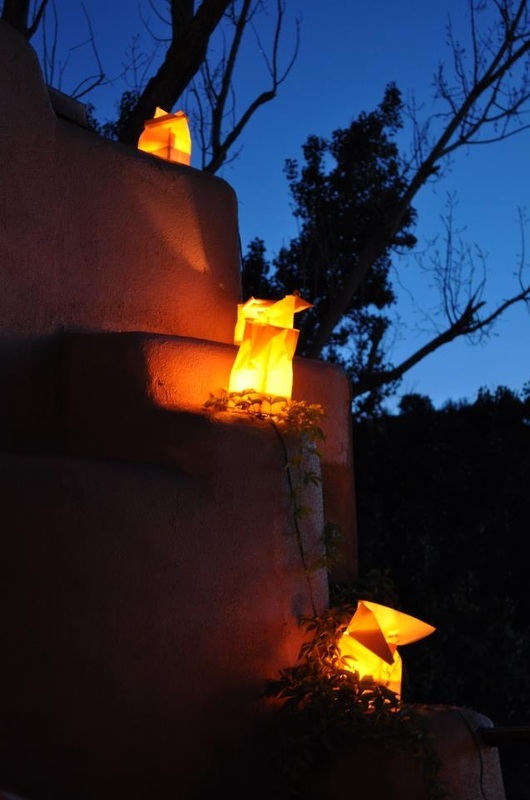 Arroyo - 200 Canyon Road; The gallery is closed, but they will have a bonfire and candy from 5 - 9 PM. Darnell Fine Art - 640 Canyon Road. Please join the Flying Farolito Brothers horn quintet this year as we again play traditional Christmas music up and down Canyon Road on Christmas Eve. We go from bonfire to bonfire playing beautiful 5-part versions of favorite traditional carols. If you spot a group of 5 cold, but happy looking musicians surrounded by a hundred or so people singing along, that's probably us, feel free to join!